In 2019 we are continuing to work and rework through the book by Dr Clarissa Pinkola Estes - Women Who Run with the Wolves. We will be working with one archetypal feminine story at a time - and using it as our basis for an embodied inquiry and dance. 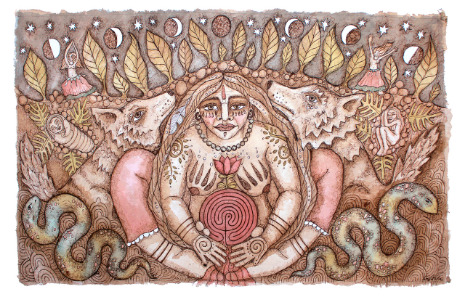 Running with Wolves - Women's 5Rhythms - offers us a monthly ritual to honour ourselves, and our sisters. This is the last story left to complete our book - and the last story of the book - The Handless Maiden. Let's finish this together. Natalie Poole is a certified 5Rhythms teacher, Dance Movement Therapist, mother and birth attendant. She has worked in schools and various settings including universities, detention centres, hospitals and clinical settings. She teaches weekly classes in Melbourne and regular workshops in Australia and Europe. Natalie has woven new maps for women to dance through their lunar/menstrual energies; their birthing/creative energies; and their empowerment/archetypal life energies and life cycles. Through her studies with Alexandra Pope (The Red School), Rhea Dempsey (Birthing Wisdom) and working with the archetypal stories of Dr Clarissa Pinkola Estes (Women Who Run with the Wolves), Natalie has absorbed the current principles of female wisdom, and interlaced these with the simple, and yet potent and catalysing map of Gabrielle Roth's 5Rhythms dance. Together these new maps form a carefully curated, sensitively synthesised, and richly multi-layered tapestry that form the basis for Natalie's women's moving medicine work. Dancing through, and embodying these maps, nurtures our well-being, our creativity and expression, and re-connects us to our essence and life-force. No refunds - be sure to prebook in order to ensure your place. Numbers Limited.